There’s a P D James quote about how the detective story isn’t really about murder; it’s about the restoration of order. That’s true for a lot of crime stories. But there’s another kind: one that uses the disruption of the established order to lift the lid on what has been accepted as normal, to show the rottenness and insanity of a system that operates from day to day without being questioned. The best thriller writers – Hammet, Le Carre, Ellroy – write stories like this. Crime stories, spy stories – stories about what “order” really means, and what that does to people who know about it. The Winter Men is a mixture of crime story and spy story, set in Russia after the collapse of the Soviet Union, when economic liberalisation created a new capitalist state ruled by criminals and spies. The main character is Kris Kalenov (who seems to spend the whole of the book wearing at least one plaster over his battered face), a veteran of a Soviet super-soldier program who’s fallen on hard times in the new Russia. He and his former comrades are just getting by, working as mercenaries, bodyguards, gangsters. Then he gets entangled in a case involving a missing girl, and becomes caught up in a conspiracy reaching from the mafiyas on the streets to the ex-Soviet spooks and oligarchs who control the levers of power. The superhero stuff never threatens to overwhelm the story or take the reader out of the narrative, but on the other hand it never becomes a metaphorical gloss on the story. The Winter Menis about what it means for people who served as symbols of Soviet power to keep on living after that system has collapsed. It’s a dense comic – there is a lot on each page to take in. It doesn’t rely on splash pages or “cool” moments, it doesn’t hold your hand and point out every element. There are significant visual and verbal cues that I completely missed the first time round. A lot of this density and cohesiveness comes from it being a comic where everyone is working at the top of their game to the benefit of the finished work. 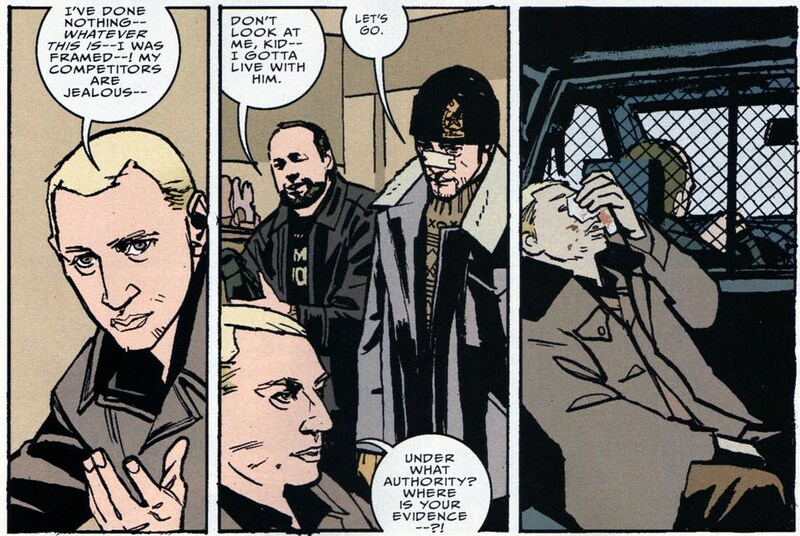 Brett Lewis’ writing is excellent, but his collaborators make it work within the comics medium. John Paul Leon is part of that Sean Phillips/Michael Lark school of pencilly, shadow-heavy art that’s usually used for “gritty” street-level spy/crime comics. He’s seriously good, and in this comic he gets a chance to flex his muscles, staging talky sequences and shootouts and car chases with equal aplomb (and anyone who reads comics should know how hard it is to do a car chase in the medium. Lewis and Leon pull it off brilliantly). It’s because his art isn’t glossy or fantastical. And that means you feel every gunshot, every punch, every instance of shattering glass and spurting blood. And the moments where the characters sit around talking are staged and drawn just as well, the excellent use of body language drawing you in to the noirish atmosphere. Dave Stewart’s colours help with this, giving the proceedings an appropriately muted tone. And John Workman’s lettering adds so much to the finished package. Where lettering is usually seen as an afterthought in comics, here it’s obvious how essential it is. Russian and English dialogue is rendered differently, leading to some excellently subtle communication of plot points that hinge on knowing who speaks both languages. There’s a unique quality to the dialogue and narration. It reads like it was originally written in Russian, then translated to English. There are odd moments where English phrases seem to be mistranslated, or metaphors are used without explaining the context. Just as in the wider narrative, you’re thrown in, and have to catch up. deeply broken society – from the power players at the top to the foot soldiers at the bottom. 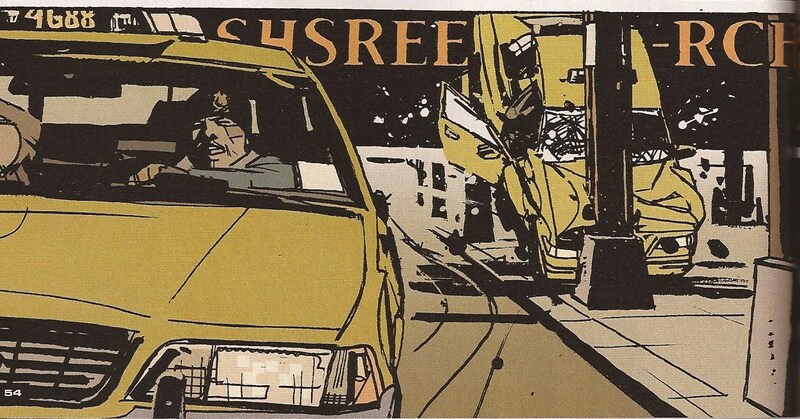 Unsparing in its portrayal of how many people suffer, bleed and die to keep the established “order” in place.There’s an issue in the back half of the book where Kris and his gangster pal Nikki spend a day driving around the city, attending to police business and Nikki’s criminal enterprises. It’s a low-key slice of life story, with little to no connection to the main plot. But you’re still riveted, because Lewis, Leon and their collaborators have created an entire world, where the lives of the characters seem to be independent of the demands of the story. That would be great in literature. It’s doubly great in comics.